Informed consent process is the cornerstone of ethics in clinical research. Obtaining informed consent from patients participating in clinical research is an important legal and ethical imperative for clinical trial researchers. Although informed consent is an important process in clinical research, its effectiveness and validity are always a concern. Issues related to understanding, comprehension, competence, and voluntariness of clinical trial participants may adversely affect the informed consent process. 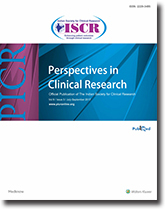 Communication of highly technical, complex, and specialized clinical trial information to participants with limited literacy, diverse sociocultural background, diminished autonomy, and debilitating diseases is a difficult task for clinical researchers. It is therefore essential to investigate and adopt innovative communication strategies to enhance understanding of clinical trial information among participants. This review article visits the challenges that affect the informed consent process and explores various innovative strategies to enhance the consent process. The Lean Six Sigma methodology for process improvements and driving efficiency is old, but lean writing was adopted late by the pharmaceutical world in terms of size of the documents. The documents were lean earlier, and then became voluminous, and now we are about to complete a full circle in this regard, i.e., coming back to the lean documents again using e-formats and hyperlinking. Furthermore, writing has become more and more precise over time. The need for this lean and mean medical and scientific writing arose from voluminous research globally, both industry and academia which are abuzz with skyrocketing regulatory and scientific submission volumes. The quantum of literature is so much that reviewers or information seekers firmly believe that going through even selected and relevant literature has become highly challenging. Considering this, there has been much insistence on downsizing the medical writing documents, which could be tempting enough to be leveraged for scientific publications as well. Here, we present the need for lean and mean medical writing, discuss this concept in relation to the pharmaceutical industry, and how to apply this to key documents. Furthermore, presented is the proposed algorithm for lean and mean clinical study reports and manuscripts. These thoughts are aligned to the recently established concept of data transparency, and can be easily achieved by web links between the protocols and clinical trial results disclosed publicly, and the corresponding manuscripts. Aim: Renal transplantation is the treatment of choice for end-stage renal disease patients. Renal transplant recipients, however, have to be on lifelong therapy with immunosuppressants, which are associated with a number of adverse events (AEs). The safety profile of these immunosuppressants is not clear with respect to the Indian population. This study was conducted to find the frequency and pattern of all AEs experienced by Indian renal transplant recipients during the initial 3 months posttransplantation. Methods: Adults undergoing their first renal transplantation were enrolled in the study. All enrolled subjects were followed up for a maximum period of 3 months. All AEs were graded for severity and classified according to the Common Terminology Criteria for AEs criteria. Results: Ninety-eight renal transplant recipients enrolled in the study. There was a loss of follow-up of 7%. Five subjects died during the study. Subjects experienced on an average 9 AEs during the study. There was no difference in frequency of AEs between those on tacrolimus and cyclosporine. Most commonly observed AEs belonged to “Investigational” and “Metabolism and Nutrition” system organ classes. The most common AE was hypokalemia. New-onset diabetes after transplantation (NODAT) developed in 28% of subjects. There were 27 episodes of acute nephrotoxicity. Conclusion: The incidence of NODAT in the Indian population is substantially higher than that observed in the Western population. The incidence of nephrotoxicity may indicate higher sensitivity of the Indian population to calcineurin inhibitors. Background: There is a lack of evidence-based therapies for the treatment of heart failure (HF) with preserved ejection fraction (HFpEF). Beta blockers may provide some benefit in HFpEF due to their proven role in HF with reduced ejection fraction. Aim: The main objective of the present study was to evaluate the efficacy of controlled-release metoprolol (metoprolol succinate) in HFpEF. 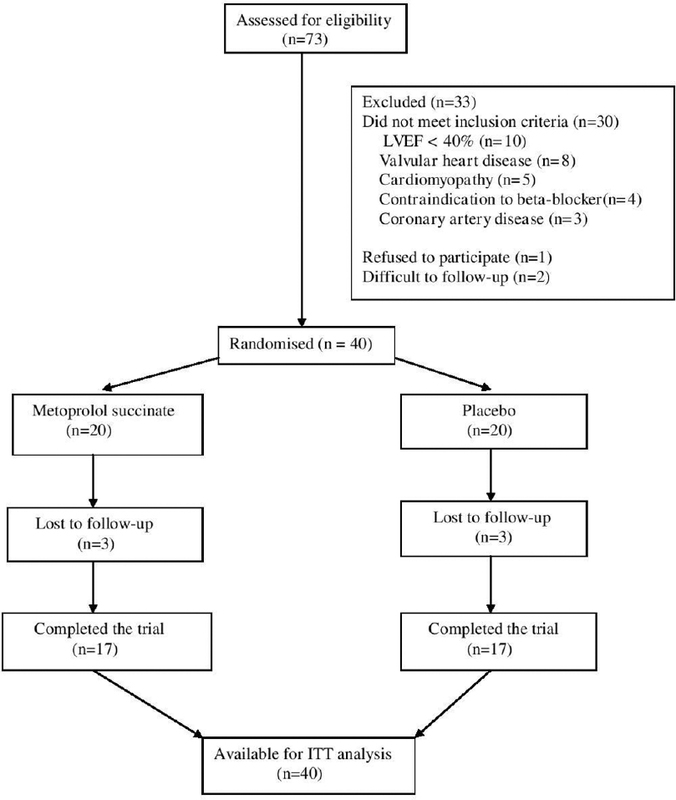 Materials and Methods: This was an investigator-initiated, randomized, double-blind, placebo-controlled, 14-week pilot study with metoprolol succinate as a study drug. Dose titration protocol was used with optional upward titration of doses ranging from 25 to 100 mg. The end points included clinical, echocardiographic, biochemical (N-terminal pro-B-type natriuretic peptide and serum carboxy-terminal propeptide of procollagen type I), and quality of life (QoL) (SF-36) parameters. Results: Twenty patients were enrolled in each of the treatment arms. An improvement in New York Heart Association class and exercise capacity was seen in both treatment arms. The mean change in various echocardiographic and biochemical parameters between the two groups was statistically insignificant. A significant improvement in some QoL parameters was observed in both the groups. No serious adverse events were seen. Conclusion: Hence, this pilot study showed that metoprolol succinate possibly has some beneficial role in HFpEF as reflected by improvement in some parameters. The findings highlight the need of a larger study with longer follow-up to provide a definitive answer. Purpose: Pulmonary tuberculosis is associated with increased oxidative stress, enhanced lipid peroxidation, and decreased glutathione (GSH) levels. N-acetylcysteine (NAC) effectively increases GSH levels, improves lipid peroxidation, and decreases reactive oxygen species levels as reported by earlier studies. 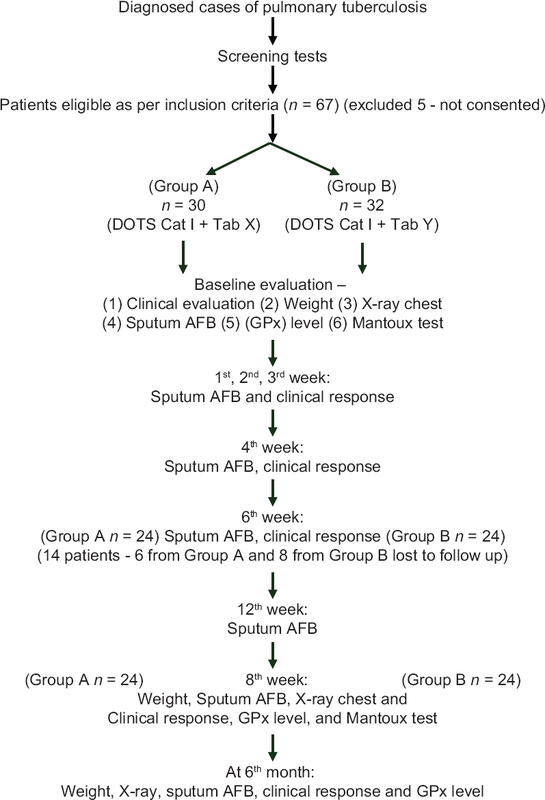 Hence, we planned to clinically evaluate the effect of NAC as add-on to Directly Observed Therapy Short-I (DOTS-I) regimen on treatment outcome in PTB with the objectives to study the effect of NAC as an add-on to intensive phase of DOTS-I (2 months) on sputum conversion, radiological improvement, GSH peroxidase (GPx) level, and weight and immunological response compared to placebo add-on at the end of 2 and 6 months. Materials and Methods: This was a design-prospective, randomized, parallel group, add-on design, placebo-controlled, double-blinded, 24-week study. Parameters studied were sputum acid-fast bacillus examination, radiological improvements, GPx level, weight, and Mantoux response. NAC/placebo was added to DOTS Category I in intensive phase. Results: Totally 48 patients completed the study. In NAC group, 23 patients achieved sputum negativity in 3 weeks while 14 patients in PLACEBO group. There was a significant clearing of infiltration and reduction in cavity size in NAC group compared to placebo at 2 months. At 2 and 6 months, NAC significantly raised GPx level and body weight. In 2 months, the patients with Mix ≤5 became Mx positive (100%) in NAC group while none in placebo group. Conclusion: NAC addition to DOTS-I significantly brings about faster sputum negativity, improves radiological response, weight, raises serum GPx level, and rectifies the deregulated immune response. Thus, NAC may be a useful adjuvant to DOTS in PTB. Background: An important challenge to spontaneous reporting system is underreporting. The sensitization and involvement of undergraduate medical students can reduce underreporting in pharmacovigilance program. Objective: To analyze the clinical characteristics and reporting quality of adverse drug reactions (ADRs) by undergraduate medical students in comparison with physicians' reporting. Methods: We sensitized the second professional year undergraduate medical students about pharmacovigilance and asked them to submit reports of ADR observed during their clinical posting from January to December 2015. We compared students' reports with those sent by physicians (Department of Medicine and Allied Branches, Paediatric, Obstetrics and Gynaecology) of our institute during the same time period. We included ADRs of “certain,” “probable,” or “possible” categories as per the World Health Organization causality definitions in analysis of both groups. 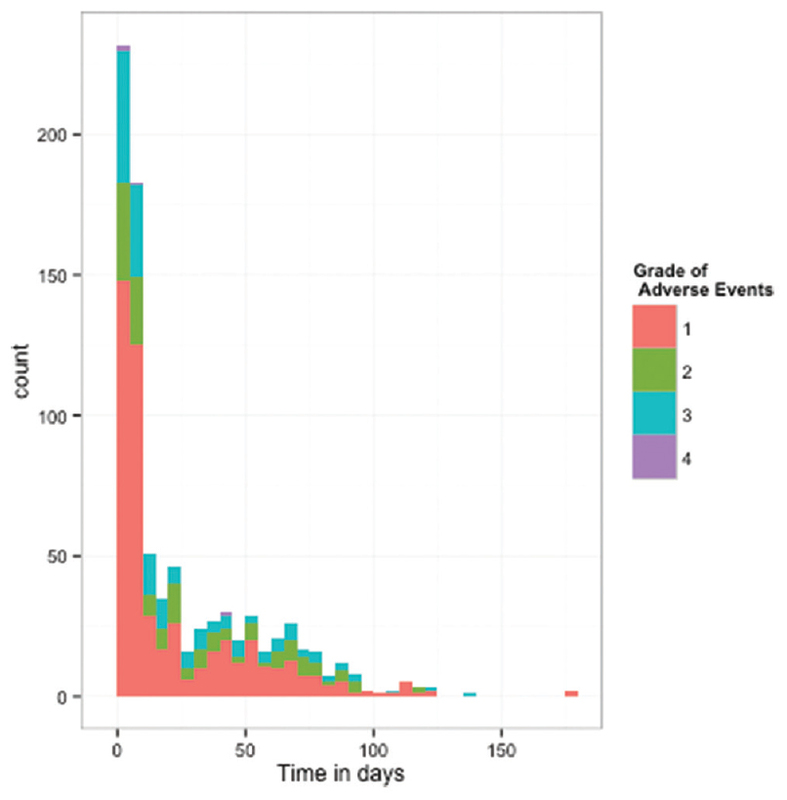 We excluded “unlikely,” “unclassified,” and “unclassifiable” causality ADRs from the analysis due to questionable association of reactions with suspected drugs. We collected data of demographics, pattern of ADRs, causative drugs, seriousness, other clinical characteristics, and quality of reporting. Results: We analyzed a total number of 176 students' reports having 269 ADRs and 143 physicians' reports covering 180 ADRs. The students predominantly reported ADRs of single drug suspect (84.09% vs. 43.35%), “probable” causality (63.94% vs. 21.11), and augmented type reactions (67.29% vs. 55%) than physicians. Both groups did not differ in reporting of serious reactions (6.25% vs. 9.09%). Students most frequently suspected gastrointestinal disorders (35.68%), whereas physicians most frequently reported skin and appendages disorders (41.11%). Students and physicians more commonly suspected ADRs due to systemic anti-infective (33.64%) and nervous system (42.07%) class of drugs, respectively. The quality analysis suggested no substantial difference in most domains of ADR reporting among both groups. Conclusion: Students' reported valuable and clinically relevant ADRs. Medical students should be exposed to ADR reporting during their clinical teaching posting and should be actively involved in pharmacovigilance program to improve detection rate. Aim: The aim of this study was to evaluate the process of accreditation resulting in improvement of the Institutional Review Board (IRB) functioning. Methodology: Randomly selected projects from years 2007 (before accreditation), 2010 (after accreditation), and 2013 (after reaccreditation) were evaluated to assess parameters, namely, submission of good clinical practices (GCPs), completeness of IRB submission form, fulfillment of quorum, documentation of the declaration of conflict of interests, and submission of the status reports. Compliance to these parameters was compared over a period of 3 years. Results: A total of seventy projects were evaluated retrospectively. Compliance of the principal investigators regarding submission of GCP certificates increased substantially from 5% to 53.1%. Completeness of IRB forms was 80% in 2007 while it became 100% in 2010 and continued even in 2013. Fulfillment of quorum increased significantly from 35% in 2007 to 100% in 2010 and 2013 after the accreditation procedures. Out of the selected twenty projects (2007), nonfinancial conflict of interest was not declared in all three applicable projects, while of 18 projects (2010), nonfinancial conflict of interest was declared in all three applicable cases. Of 32 projects (2013), nonfinancial conflict of interest was declared in seven out of eight applicable cases. Timely submission of status reports increased from 10% in 2007 to 38.9% in 2010 and 37.5% in 2013. Conclusion: Accreditation plays a vital role in the improvement of IRB. The policies and procedures formulated and implemented during the process of accreditation resulted in improvement of IRB performance. Continuing training of the IRB and researchers is required to maintain the accreditation. Logistic regression analysis is a statistical technique to evaluate the relationship between various predictor variables (either categorical or continuous) and an outcome which is binary (dichotomous). In this article, we discuss logistic regression analysis and the limitations of this technique.